Google Now notifications will show up in Chrome’s notification center. To check them, click on the bell icon on your desktop (Mac and Windows) or the numbered box (Chrome OS). Cards will only be visible on your desktop computer if you use Google Now on your mobile device and if you’re signed into Chrome. The ones you see are a subset of Google Now’s mobile cards: they include weather, sports scores, commuter traffic, and event reminders. Some cards may be based on the location of your mobile device (which hopefully is near the computer you’re using) but others will work regardless. If you use Google Now on multiple devices, Google says you will need to manage your location settings for each device independently. The following links will let you change Location Reporting on Android and iOS. Click the bell icon in the lower right corner of your computer screen (on Windows) or the upper right of your computer screen (on Mac) to open the Notifications Center. In the Notifications Center, click the gear icon on the bottom right corner (on Windows) or the upper right corner (on Mac). We’ve been following Google Now’s slow but steady arrival to Chrome, starting with hints in Chromium’s code over a year ago all the way to its arrival in Chrome Canary in April 2013 and when it became actually usable last month. 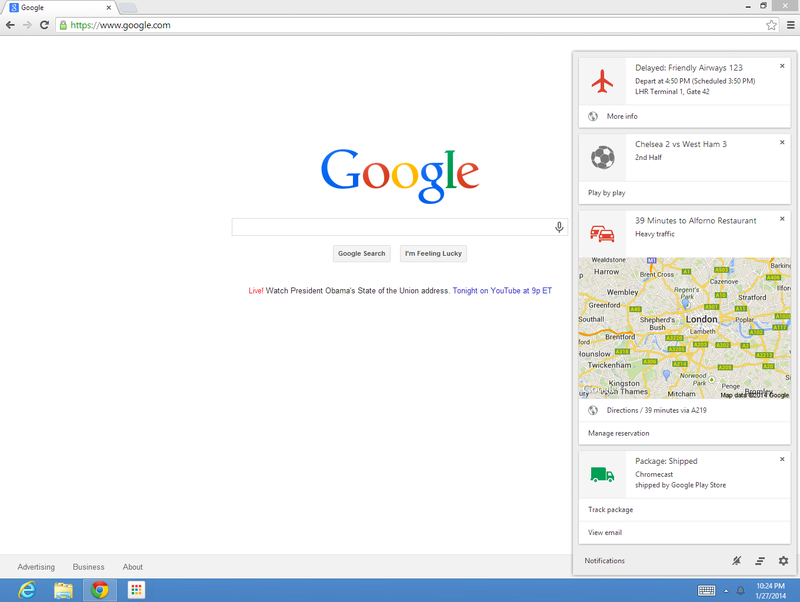 Now it has arrived in the beta channel, meaning it’s just one step away from being available to all Chrome users.